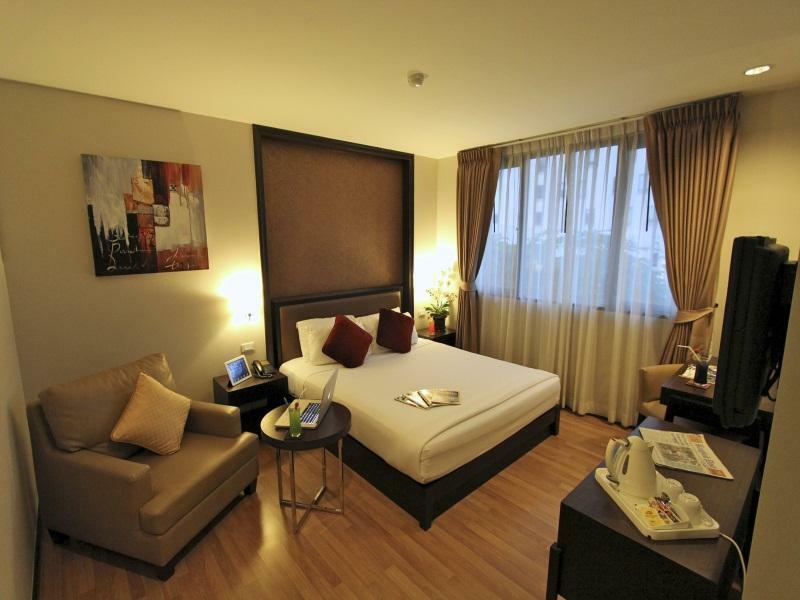 Have a question for The Dawin Bangkok Hotel? "The hotel was clean and food good." 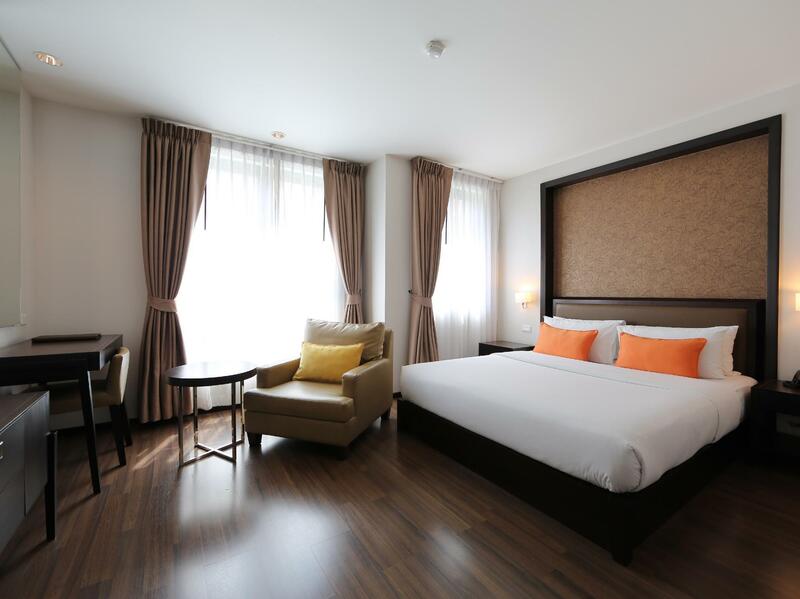 "Have stayed here twice and enjoyed my stays , clean, great location and excellent staff"
"Very nice hotel, perfect location, on top of everything"
"Everything is great, will definately come back agaim"
Book your visit to the Dawin Bangkok Hotel in Bangkok for a memorable vacation. The rooms here overlook the city for stunning views of Bangkok. The hotel is near Nana Fashions, R and R Apparel International, Hi-Mark Tailor, La Moda, and Tom's Fashion. It features a bar, restaurants on-site, a coffee shop, and room service, so you can choose to dine in or grab a snack. The Dawin Bangkok Hotel features a kids club, offering parents a safe childcare option to keep their little ones happy. Offering guided tours, it is the perfect place to stay to learn about the area and see everything you can while you're here. It has several convenient features, such as safety deposit boxes, a currency exchange, an infirmary, as well as a smoking area. There's free Wi-Fi in all rooms, as well as Wi-Fi in common areas, so you don't have to spend money on a local sim card while on vacation. From a concierge to luggage storage, the Dawin Bangkok Hotel has various useful services for guests to utilize. The hotel is pet-friendly, so you don't have to worry about finding someone to look after your pet while you're away from home. The front desk is open around the clock, ensuring that there is always a member of staff behind the desk to answer any questions you may have. Check-in is offered from 02:00 PM and check-out is from 12:00 PM. 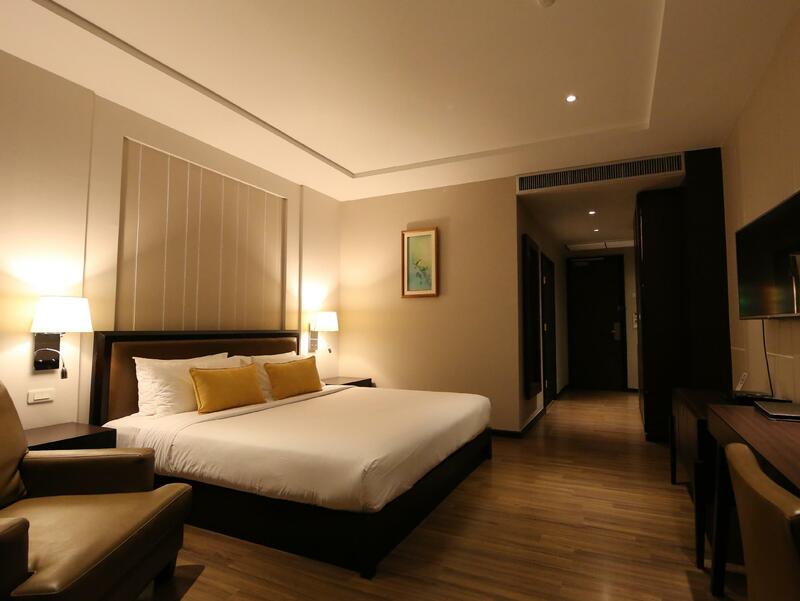 The Dawin Bangkok Hotel offers an assortment of transportation options, such as airport transfers, shuttle services, and taxi services, getting you that much closer to all there is to explore in the city. Nana BTS Station is 310 m away and Phloen Chit BTS Station is 680 m away. The nearest airports are Don Mueang International Airport (DMK) and Suvarnabhumi International Airport (BKK), which are 20.3 km and 22.1 km away. "Central location and staff is nice." Good hotel. Very friendly staff, restaurant and cleaning. Rooms are comfortable and very clean. My room was at the back of the building and quiet. Breakfast was good, and restaurant area has both indoor and outdoor areas. Short walk from Nana Plaza and Sukhumvit red, also the BTS Moderate room price , I paid about 1900 baht/ night for my room. Pool on roof is small and shallow, can,t really swim but nice to cool off. Closes too early though at 1900 hrs. Need to leave open for use till 2100 hrs. Hotel is guest friendly for the single guys. Pity that they don’t have a tuk tuk service running, like so many other hotels in the street. I would definitely return. They checked in quickly and efficiently. Cleaned room promptly. Was very clean and great location. Only downside was small pool. I was fully aware of this when booking. But that’s the price you pay. Would recommend to any other traveler on short stay. Didn’t end up staying as they had no parking as they had provided Agoda with false information. To top it off when Agoda contacted them they said they provided parking at a sister hotel despite 3 of their checkin staff saying they did not. No refund of course. The lobby looked OK. Overall, I'm pleased with my stay. I booked through Agoda and reservations were quick and easy. Hotel is towards the end of Soi 4, so it is away from the noise of Nana Plaza, but still an easy walk from hotel if that is your thing. Close to Sukhomvit Nana BTS line. Food in Dawin restaurant over priced. Street food vendors are better value for your money and they are close and there are at least 3 7-Elevens within a short walk for daily needs. Hotel is short walking distance from food, shopping, bars and entertainment. Guest friendly. Breakfast, if not included is reasonable ang good. Outside tables for those who smoke with ford and bar service. I have used the Dawin hotel for many years and have always been satisfied with the standard and accommodation. However I have noticed in my last three visits that the aircon's are not at their best and really need changing. The rooms are perfect for me. 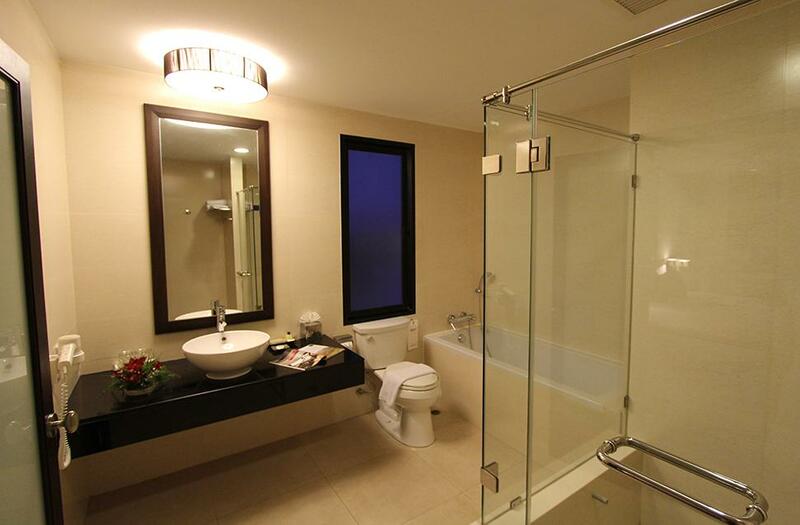 The shower/bathroom are spacious. The room itself is not too small, the bed was big and comfortable. The employees at the front desk all speak great English and are friendly and helpful.There is a small restaurant at the front of the hotel which served good food, although I only ate there once. The location is on a street near many bars, a hooters and is only down the street from the train station. I have used this hotel many times. rooms are large enough and clean. location is great if you like the night life Soi 4 has to offer! This is a very good hotel in a great location for tourists with easy access to most tourist attractions and also the Skytrain. We have used this hotel on many occasions and have recommended it to many people who after their stay all said it was impressive .A nice restaurant and bar with excellent rooms. 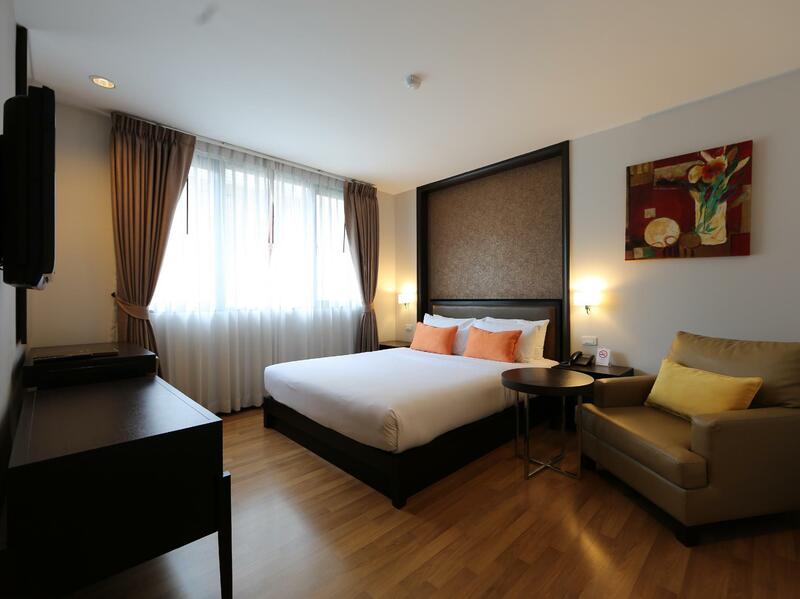 This is an excellent hotel in the heart of Bangkok's main nightlife district. Location is a 5 minutes walk to NEP and 10 minutes to the Nana BTS station, so very convenient. Staff was super friendly, both in the hotel reception as well as in the small on-site restaurant. Room always cleaned spotlessly every day and the breakfast was available until 12:00, which is great since you're not getting up early after partying the whole night. There's also no additional fees for bringing in one guest to your room. Absolutely recommend for those planning to stay in the Nana area and I might return to the Dawin hotel in the future. No complaints from me. I enjoyed my stay, so you can guess the rest. However, I would like to mention a few minor points. I found the cups in the room to be too small. Larger cups would be better. The hotel television had a small nu,bee of channels. Not come to Bangkok to wat h tv to be honest, it would be nice if CNN or BBC World were included among the list of channels. Not a deal breaker though. If you want to stay close to the center of the action in Bangkok this is one good place to stay. The rooms are nice and clean. The staff is very friendly and very helpful. I’ve stayed here twice and have enjoyed my stay there both times. I stayed here for 1 night in the deluxe room. Very nice room big comfy bed, big flat screen tv, Big bathroom with a good shower plus free shampoo and shower gel. There is a room safe and a kettle with tea and coffee. There is no joiner fee here and its only a 5 minute walk from Nana Plaza and all the bars at the top of the Soi. I stayed here again for 2 nights at the end of my trip everything just as good. Very good front desk staff. Good location to spend one night before our cruise. Taxi fare was $28.00 to Circular Quay. Pub across the road with great meals and cold beer. Woolworths supermarket right next door. Lovely place to stay, the staff are polite and very helpful especially the girls at reception. I found 3 power sockets in room so don’t know what previous guests review was about, obviously didn’t have his glasses with him. Food here is very good and the location os perfect. You wont be disappointed by choosing this hotel!! Size of the standard room is absolutely ok. Room was clean - nothing to complain. Though in the red light district, hotel is also quite. Staff was super attentive, friendly and helpful - felt also save at all times.. Good connection to BTS. Don’t expect anything too much from the rooftop pool - its tiny, lab swimming is not possible.